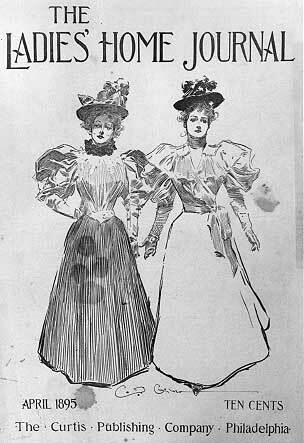 In the 1890s, Charles Dana Gibson’s magazine illustrations of fashionable young women gained wide popularity. The physical type he portrayed became the standard of beauty, a romantic ideal that suggested a new female independence while also celebrating the privileges and glamour of elite society. Within a few years, women who viewed Gibson’s illustrations in magazines were more likely to work for wages. Growing opportunities for white collar work in stores and offices attracted white women who spoke English, although they were paid roughly half of what their male counterparts received and were often subjected to discrimination and harassment. Source: Charles Dana Gibson, Ladies' Home Journal, April 1895—American Social History Project.